Dolcetto is a grape that is grown in the northern part of Italy The wines from this grape can be made in a Nouveau style and consumed young, or a “New World ” style, that is often aged for a short time then consumed. That dichotomy may seem strange. That nomenclature distinguishes the separate styles of wines made here in California and in Italy. A brief description of this grape and wine for those who are not familiar with it may be of interest. Dolcetto is a dark-skinned wine grape. It grows in the hills of northwestern Italy. The variety has successfully made its way to the United States. Piedmont in Italy is generally regarded as its spiritual home. De Angelis Wines first release of Dolcetto is a non-vintage estate wine. this is due to the fact that our vines are still relatively young, and not yet at peak production yet. Consequently, after taste trials, we felt that the 2014 and 2015 crops would perfectly balance once blended. They did! 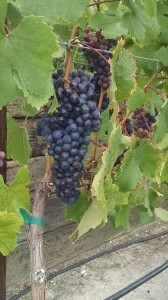 We grow our Dolcetto (see photo) about 3 miles from the Pacific Ocean. The vineyard produces 2.5 – 3.0 tons/acre. 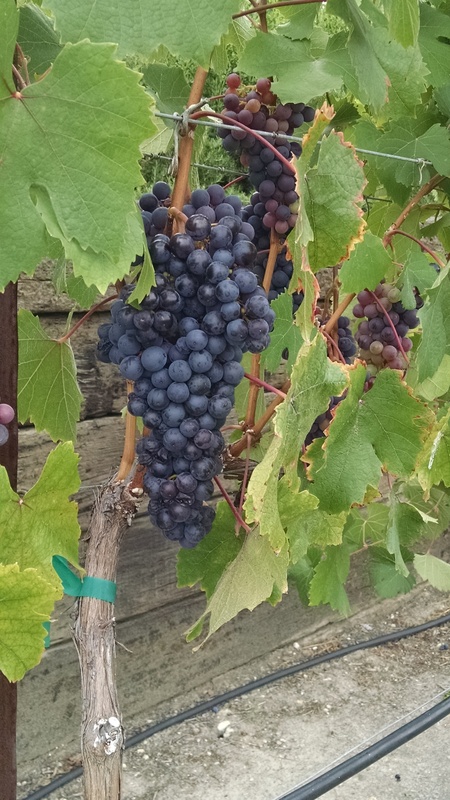 The Brix of this Dolcetto at pick was 24.7. The pH was 3.5. The Total acidity (TA) was 0.63. [Since this is a blend of Dolectto, the average Brix, pH and TA are provided here.] We fermented the fruit with a yeast specifically chosen for this grape. The fermentations in both years were smooth. They presented no problems. Thus NV Estate Dolcetto is a rich, dark purple wine that offers aromas of black cherry, black raspberries, and coffee. On the palate, this wine is perceived as jammy with tastes of dark cherries and black raspberries. De Angelis Wines ages this wine in French oak for an average of 10 months. Thus it also shows notes of oak. Given this, we believe that this wine offers a a great to enjoy a wine wine that drinks well young. It will also age nicely for 3-5 years. We particularly enjoy its acid balance, mouthfeel and finish. Regardless of style – when young or aged a bit Dolcetto is a great food wine, and pairs with a wide variety of meats and pasta dishes.